These Reality Shows are too violent!!!! I guess these starts will risk it all for ratings and a check!!! Blood, Sweat and Heels” star Geneva Thomas had been arrested and charged with felony assault. In case you missed it, during a recent taping of the Bravo series, Geneva got into a fight with Melyssa and allegedly hurled a Vodka bottle at her head. Following the incident, Geneva was taken to a police station and Melyssa was rushed to the hospital where she was treated for a head injury. TMZ recently caught up with Melyssa, who was being wheeled into Lenox Hospital on Thursday. 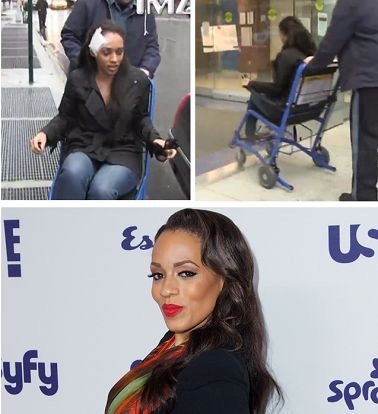 The cameraman caught up with her as she was being helped out of a town car and into a wheelchair of sorts. Apparently, a head injury wasn’t all that she sustained during the brawl, as one of her feet were wrapped in an ace bandage. I watch them…Yes I think they are becoming to violent!! !